I've got fabulous stories to share from my extended carnie tour, including a bit on couch surfing, but first things first. Being a carnie has it's perks, but there can be none better than chatting up a wild cat handler for a glimpse of the liger. 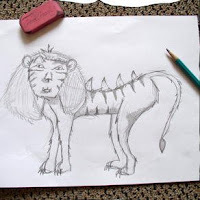 Ligers are real! It's not just some Napolean Dynamite doodle as I once imagined. But wait, there's more...I got to FEED a liger. Seriously. It involved meat on a stick and not my flesh, thankfully. And it was totally magic. I want a Liger in my two bedroom flat. I see no flaws with that plan.